Gospel for Asia trains and sends native workers because they have proven to be extremely effective. Native workers are already familiar with the language and culture, and live at the level of the people they serve, thus removing many social barriers. 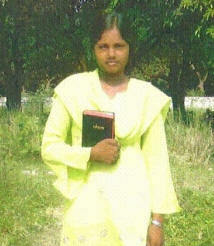 Having been miraculously healed as a young girl, Virbha chose to give her life to Christ and now is a student at a GFA Bible College. It’s a 2-year study program with an additional 1-year practical program. On weekends during her time at the college she does evangelistic outreaches. The third year focuses on church planting and determining the focus of her ministry once she graduates.